Pablo Picasso drew L'Homme au Gibus, or Man With Opera Hat, in 1914. 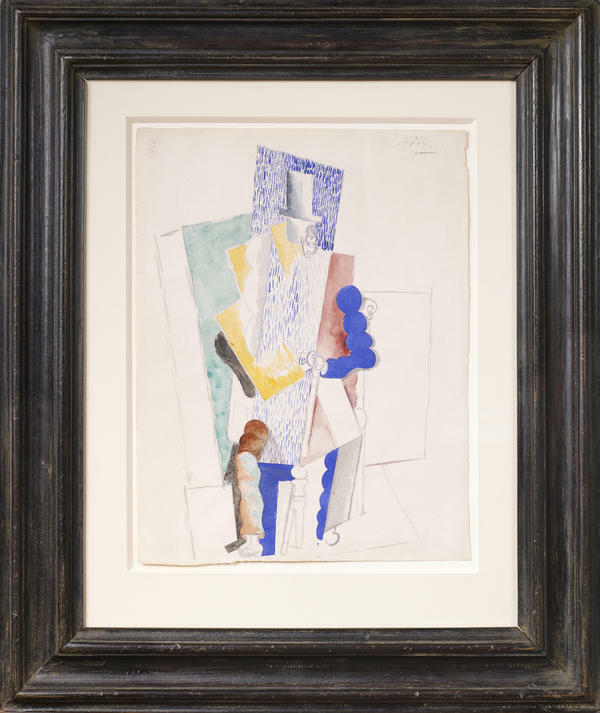 Imagine buying a genuine Pablo Picasso painting valued at $1 million — and paying only $135. That's the prize if you win the "1 Picasso for 100 Euros" raffle Sotheby's is currently putting on. It's the first time a Picasso has been offered as a raffle prize, and while 100 euros (about $135) isn't cheap for a raffle ticket, at one in about 50,000, your chances of winning are a lot better than the megalotteries a lot of people enter. Peri Cochin, a journalist and television producer in Paris, explains that the idea for an online raffle came about when she was faced with attending yet another gala charity dinner. She and her mother, who is Lebanese, plan fundraising events for the International Association to Save Tyre, an ancient Phoenician city in Lebanon. Tyre's monuments have suffered from Lebanon's civil wars, and the city, a UNESCO World Heritage Site, has been damaged by urban blight. When Cochin's mother suggested the charity gala, Cochin thought: Not again. "All those gala dinners," she says. "You go there, you sit and you are really bored very quickly, and you look to your watch and hope that 11 o'clock will arrive quickly and you can go home and be quiet and forget about that dinner." Cochin wanted to try something new. They came up with the idea for an online raffle that would intrigue people from all over the world, not just the usual suspects at a charity dinner. Cochin knows Olivier Picasso, grandson of Pablo Picasso, who is also a television producer in Paris. Together, they looked for a Picasso drawing, and found Man With Opera Hat. Olivier Picasso, who is writing a biography of his grandfather, says the painting is from 1914, "the peak of the cubism period of my grandfather. It's the second part of the cubism history, when Pablo was more studying how to symbolize things than just to draw them. " Cochin says many people think the raffle is a joke, but "it's not a joke here," she says. "We're talking serious business." According to Cochin, they had to work for almost two years to get official authorization. In France, raffles and lotteries are run by the state, so the French Finance Ministry will collect the money and supervise the raffle. The money will go to two projects of the International Association to Save Tyre, both focusing on Lebanese women in need. Cochin emphasizes that this raffle is not just for art aficionados or collectors. "It's mostly people that are dreaming of something that is not possible to get," she says, "and, all of a sudden, yes, you can maybe have it." Picasso adds, "You know, there are more chance[s] to win than when you play at the New York Lottery." The raffle drawing is Dec. 18 at Sotheby's in Paris. If they sell 50,000 tickets, they'll make 5 million euros, or close to $7 million. Even if you take off $1 million for buying that Picasso, it's a pretty good haul for a charity event. Imagine buying a genuine Picasso and paying only $135 for it. You really can if you're very lucky. For the first time, a Picasso is being offered as an online raffle prize. Raffle tickets cost 100 euros, that's about 135 bucks, and are now on sale. $135 is a lot for a raffle ticket, but the potential payout is tremendous. And, get this, your chances of winning are one in about 50,000. That's a lot better than those mega lottery some of us enter. NPR's Margot Adler reports. MARGOT ADLER, BYLINE: Peri Cochin is a journalist and television producer in Paris. She and her mother, who is Lebanese, were planning a fundraising event for the International Association to Save Tyre. Tyre is an ancient Phoenician city in Lebanon. Its monuments have suffered from Lebanon's civil wars. It has also been damaged by urban blight and is now a UNESCO heritage site. But when her mother suggested a charity dinner gala, Cochin thought, not again. PERI COCHIN: All those gala dinners, you go there, you sit and you are really bored very quickly, and you look to your watch and hope that 11:00 will arrive quickly, like this, you can go home and be quiet and forget about that dinner. ADLER: So she came up with the idea of an online raffle that would intrigue people from all over the world, not just the usual suspects at a charity dinner. Cochin knows Olivier Picasso, grandson of Pablo Picasso. They thought, let's get a Picasso work as the prize. They acquired "Man with Opera Hat." Olivier Picasso, who is writing a biography of his grandfather, says the color drawing is from 1914. OLIVIER PICASSO: Which is, let's say, the peak of the cubism period of my grandfather. It's the second part of the cubism history, when Pablo was more studying how to symbolize things than just to draw them. ADLER: The drawing is valued at around a million dollars and a ticket to win costs $135. COCHIN: So it's not a joke here. We're talking serious business. ADLER: Cochin says many people think it's a joke. And yet, they had to work for almost two years to get an official authorization because in France, raffles and lotteries are run by the state. So, the French finance ministry will collect the money and supervise the raffle. The money will go to two projects of the International Association to Save Tyre, both focusing on Lebanese women in need. Cochin says this raffle is not just for art aficionados or collectors. COCHIN: No. It's mostly people that are dreaming of something that is not possible to get and all of a sudden, yes, you can maybe have it. PICASSO: And, you know, there are more chance to win than when you play at the New York lottery. ADLER: Tickets are at 1picasso100euros.com. The drawing is December 18th at Sotheby's in Paris. COCHIN: To get a Picasso for 100 Euros, that is $135, it's quite crazy. ADLER: And if they sell 50,000 tickets, they will realize 5 million euros, or close to $7 million. Even if you take off a million for buying that Picasso, it's a pretty good haul for a charity event. Margot Adler, NPR News, New York. Transcript provided by NPR, Copyright NPR.